With spring just around the corner, I’ve been wanting a lightweight, lacy accessory that would be pretty, and be simple to make. Also, crochet thread is something I’ve just begun dabbling in, so the simpler the better! This scarf delivers on both accounts with a simple, but pleasing stitch pattern that is repeated as many times as you want, to make this lace scarf as wide or narrow as you’d like. 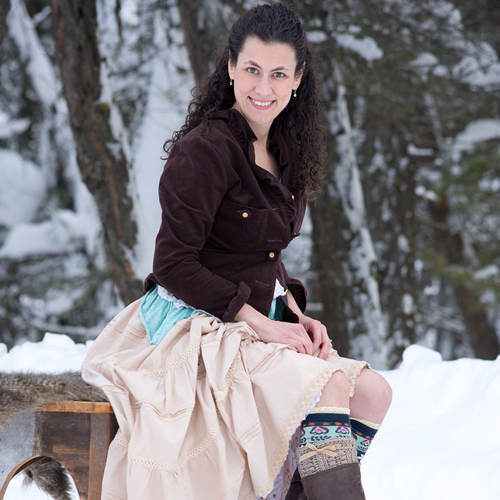 -Finished scarf should measure approximately 5” wide, by 60″ long without fringe, 72″ with. Row 1: dc in 4th ch from hook. Ch 5, skip 5 chains, dc in 6th ch, dc in next stitch, ch 1, skip 3 chains from the double crochet, Shell stitch in the 4th chain, ch 1, skip 3 chains, dc in the 4th ch, dc in next chain. *ch 5, skip 5 chains, 1 dc in next 2 chains, ch 1, skip 3 chains from the double crochet, Shell stitch in the 4th chain, ch 1, skip 3 chains, dc in the 4th chain, dc in next chain. * repeat * to * until the end. Note: You should end each row with a ch 5, skip 5, dc in the 6th ch, dc in the final stitches (or top of ch 3). in the 4th stitch, dc in next stitch* repeat from * to * until end. Repeat row 2 until you have a total of 12 rows (13 if you count the chain as a row). Note: You do not have to cut your yarn when working the first end. Cut thread and repeat rows 1-4 for the other end of the scarf. Weave in all ends. Cut 4-6, 12″ lengths for fringe per eyelet. Loop fringe around each eyelet. Dampen scarf, stretch out and pin on a blocking board, or lay flat on a hard surface, until dry.Thank you so much for stopping in! You can also find me on Facebook, Pinterest, Instagram, and Ravelry. 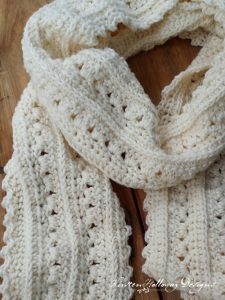 The Simply Lace Scarf pattern was made to be used by individuals, and small business crocheters alike. Selling your finished pieces in boutiques, at farmer’s markets, craft shows and other events is encouraged! The only thing I require is that it not be used commercially to produce millions of copies. Love this pattern! Easy enough for a beginner (that's me!) and the finished product is adorable. Perfect length. I did just eleven rows, making it a cute, summer semi-skinny scarf. Off to make another… Thank you! I love the look of this scarf and I have a beautiful yarn I want to use, however I have a DK yarn just wondering if you think it will work the same if I adjust the number of beginning chains?? Where can I get this pattern on PDF form to print? Hi can you provide instructions for the shell stitch? Thank you! In this pattern a shell is 4 dc worked in one stitch, or between the 2nd and 3rd dc stitches of the previous row’s shell. I hope that helps! Would you please clarify if it is a 3.25 steel crochet hook that is required or an aluminum hook to make this scarf with the Red Heart #3 Fashion crochet thread? Thankyou. Thanks for your reply. I have a D-3 US 3.25 mm aluminum crochet hook. I am assuming that is what I need, as it is larger than a steel hook which would be a 0(3.25 mm) hook. What would the Gauge be for this scarf? I checked my ball of Aunt Lydia’s fashion 3 crochet thread and wondering if 2 balls were enough for the scarf you made? Each is 150 yards or 137 m per ball. The awesome thing about this is that gauge isn’t super important. I have measurements listed, but if the scarf isn’t exact it’ll still look nice. I think I used just a smidge over 2 balls of thread, but it’s been a while since I made this. Thankyou for your quick replies back to me and for clarifying the details I needed. I am looking forward to trying this pattern. The scarf looks lovely. I crochet so tight for some reason. I’ve tried to loosen up but still can’t seem to get it right. I started this scarf but it isn’t near long enough. It’s only measuring 58″. I’ve completed 3 rows so far. I did make 299 chains to begin. Can you give me an idea on how many more chains I would need to make it as long as the one in the picture? This is probably an impossible question to answer without seeing it. Your best guess would really help. Thanks! You could try starting with a chain of 331, to see if that would give you an extra foot in length. The pattern is worked in multiples of 16 + 3, with an additional 8 stitches for half a pattern repeat at the end of the scarf. So when figuring out increases just add 16 to the beginning chain number (If you need it longer, try 331+16=347). I hope that helps clarify! Thank you Kirsten. I’ll give it a try. Update! It’s coming along and looking good. Thanks! Hi Joyce, it’s multiples of 16+3, with an additional 8 stitches beyond that (as mentioned in the notes just above the pattern). The extra 8 stitches creates the end that you are missing. If you don’t want to redo the row, just turn, and slip stitch over to the center of the shell, then ch 3 for the first stitch of the shell and work 3 more dc beside it before continuing the pattern. Your stitches should all match up, so it’s dc in dc stitches, shells in shells, and chains over chains. I’m sorry the part about the 8 additional stitches didn’t jump out at you initially. Hopefully this helps! Hi Kirsten! Do you have any other scarf patterns that can be used with crochet thread opposed to yarn. I would like to make a couple more for spring and summer and prefer the thread. Is there any other crochet thread that works for scarves besides #3? I live in a rural area and the nearest craft store is 30 miles from me. We have a Walmart and that’s it. Thanks!! !